Donald John Trump Jr. is an American businessman, economist and television personality. Firstborn son of the tycoon and president of the United States Donald Trump. Currently, with his sister Ivanka and his brother Eric, he holds the position of executive vice president of the family business The Trump Organization. Under the influence of his mother, he speaks fluently Czech. On November 12, 2005, he married the model Vanessa Haydon Kay. The ceremony took place in the prominent "Mar-a-Lago" of Palm Beach (Florida) and was officiated by her aunt Maryanne Trump Barry, her father's older sister, who was Judge of the District Court of New Jersey and the Third Circuit Court of Appeals of the United States. For anyone who wants to attend an evening of "conversation and dinner" in India with the eldest son of the president of the United States should pay $ 39,000, but even then it is likely that there are no tickets. 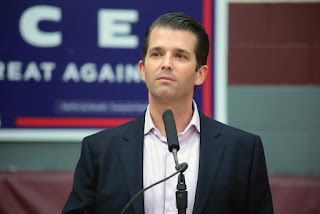 For more than a week, in the newspapers appears the publicity for those who pay $ 39,000 in advance for an apartment in a Trump building under construction in a suburb of New Delhi that could attend a dinner with Donald Trump Jr. on Friday. According to the statement to the press, the sum had to be paid before Thursday. The executives of M3M, the Indian company that will build the Trump complex, did not respond immediately to requests for statements. Trump Jr., who was in charge of the Trump Organization with his brother Eric since his father assumed the presidency, arrived in India on Tuesday to promote real estate projects with the Trump brand in various parts of the country. In addition, a speech on India-Pacific relations will be delivered at a business meeting in New Delhi, which will also be attended by Prime Minister Narendra Modi. More than 85 apartments worth $ 108 million have been sold in the Trump Towers not yet built in Gurgaon, outside the Indian capital, said Kalpesh Mehta of Tribeca Developers, the Indian partner of the Trump Organization. The apartments, whose construction should end by 2023, cost between 775,000 and 1.5 million dollars. On the eve of the arrival of Trump Jr., apartments had already been sold for 15 million dollars, Mehta confirmed this to the ET-Now television station. Press access to Trump Jr. is selective and only a few journalists directly chosen can attend their events. The Trump Organization charges a fee to Indian partners who build properties under the Trump name. There is already a completed complex in the city of Pune and there are four others in varying degrees of construction, in Mumbai, Calcutta and two in Gurgaon. All transactions are prior to the Trump presidency, but the Trump Jr. promotional trip has raised ethical concerns. Trump Jr. has made several trips to India in recent years and has highlighted the business opportunities offered by the country. In addition, he rejects criticism that his family business gets revenues from the presidency.